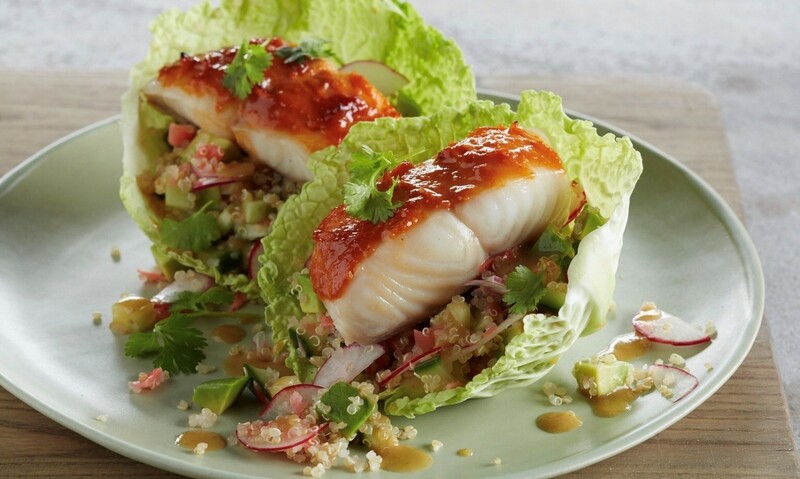 Blend the miso, chili paste and honey and then spread it on the Alaska Black Cod. Place the cod fish portions on a spray-coated, foil-lined baking sheet. Roast for 5 to 7 minutes, cooking just until fish is opaque throughout and cod is a deep golden brown. Remove the fish from the oven and allow it to cool slightly. Combine in a mixing bowl the chopped avocado, cucumber, radish, ginger and rice or quinoa, Add the salad dressing and toss to coat. Place about one-third cup of the vegetable/rice mixture into each lettuce leaf. Top with a black cod portion. Sprinkle on 1 tablespoon cilantro and serve immediately.